Are Globalists Setting The Stage For A Global Economic Reset? Since the beginning of this year, I have been warning that trade tariffs initiated by Donald Trump would develop into a full-blown trade war with China, and perhaps other nations, and that the timing of this trade war is rather suspicious. Almost every instance of further escalation was made by Trump around the exact time that the Federal Reserve was also making a large cut to its balance sheet or raising interest rates. Instead of focusing on the fact that extreme volatility has returned to markets because central banks are pulling the plug on life support, the mainstream media is holding up the trade war as the ultimate culprit behind the accelerating crash. In other words, Trump's trade war is acting as a perfect distraction from the crisis which the banking establishment has now deliberately triggered. The initial response to my suggestion by a minority of liberty movement activists and skeptics was outright denial. Some people argued that the trade war would be over before it even began and that China would immediately capitulate in fear of losing the U.S. consumer market. Others argued that the trade war "had been started by the Chinese years ago" and Trump was simply "fighting back." Clearly, the trade war is not fading away as many assumed. As I predicted, it is only continuing to grow. And the notion that a trade war is necessary at this time in defense of the U.S. economy ignores certain realities. For example, the trade deficit itself was never "theft" by the Chinese, but a BARTER between the Chinese and the U.S. government and U.S. corporations. In exchange for the Chinese and other trade partners using the dollar as the world reserve currency (and petro-currency) and buying up US treasury debt, U.S. elites have arranged a deficit advantage for China. One could also add China's cheap labor and low cost manufactured goods as part of that barter as well. Now, if Trump had pressured corporations to bring manufacturing back to the U.S. in order to reap the rewards of his dramatic tax cuts, tariffs after the fact might make a little more sense. With production back on U.S. soil we would have more economic stability to weather future crisis events. Instead, Trump gave corporations a tax cut for nothing. And instead of using that extra capital to innovate or add value to the real economy, companies used the money to continue artificially propping up their own stock prices through stock buybacks. "Of course, the outcome is being touted by both sides as a "win," but it is clear that the goal was to head fake the public rather than actually resolve trade disputes. Will the 90-day delay be seen as "good for markets?" Possibly. Though, the housing market, auto market, and credit markets will continue to crash as they have been for the past few months. I expect this development might buy stocks another week of rest, but little else. As the next Fed meeting approaches this month and it becomes clear that they intend to continue hiking rates into 2019, the false optimism will fade. I also expect that negotiations with China will fall apart yet again well before the 90-day delay is over..."
The arrest of Chinese CFO of Huawei Technologies, Meng Wanzhou, has immediately destroyed any possibility of legitimate diplomatic negotiations going forward, and this seems to be by design. The 90 day "truce" set apparently by verbal agreement during G-20 is likely over mere days after it started. National Security adviser John Bolton admitted in an interview with NPR that he was aware that Canada was preparing to arrest Meng at the request of the U.S. while he was eating grilled sirloin with the Chinese. The claim that Trump was not aware of the situation, to me, sounds absurd. The detainment of Meng and the targeting of Huawei comes with a host of significant potential consequences. First, as noted the trade truce is likely dead on arrival. While Trump continues to claim that progress is being made and that "soybeans are being sold", we have heard this kind of rhetoric for the past several months. These claims are designed to produce headlines that create a steam valve for stock markets, bringing them down slowly instead of collapsing them outright. Second, the possibility of further escalation of tariffs is much higher (U.S. farmers should not expect a reprieve anytime soon, despite rumors of "progress"). If this trend continues, the trade war will eventually expand into a war on the U.S. dollar itself, and when it does, the U.S. will suffer the worst fiscal crisis in its history. Without the world reserve status of the dollar as well as continued foreign investment in U.S. debt, what's left of our economy will disintegrate. Meng's arrest is a deliberately engineered "linchpin." I have written extensively in past articles on DARPA's "linchpin theory," which is a kind of propaganda exercise more than a theory. According to DARPA, overly complex systems invite growing instability, and like a chain of dominoes, the smallest part of that system could be knocked over by a minor event causing a chain reaction that ends in total collapse. Linchpin theory also asserts another lie -- the lie that most disasters are a product of "random chance." The problem is that the only way that linchpin theory works is if disasters are created through conspiracy, not coincidence. A system must be purposely weakened over time to the point that any crisis will translate into a collapse of the entire edifice. Central banks have done this quite expertly through the use of debt-based bubbles, followed by fiscal tightening into economic weakness. When you build up an economy like a great Jenga tower and begin pulling the most vital pieces in a calculated manner, eventually it's going to come crashing down. So which piece represents the supposed "linchpin" in our system today? Well, any piece might do the trick, but the arrest of a Chinese corporate executive (which the Chinese will consider hostage taking) at the very onset of a fragile trade truce is an excellent catalyst and also an excellent distraction. "The Fed's neutral rate efforts suggest a turning point in late 2018 to early 2019. Balance sheet cuts are expected to increase at this time, which would also expedite a crash in existing market assets. The only question is how long can corporations sustain stock buybacks until their own debt burdens crush their efforts? With such companies highly leveraged, interest rates will determine the length of their resolve. I believe two more hikes will be their limit. If the Fed continues on its current path the next stock crash would begin around December 2018 into the first quarter of 2019." The timing of the arrest of Meng coincided perfectly with the Fed's expanded balance sheet cuts. The Fed has now shifted from $30 billion per month to $50 billion per month in dumped assets. While Trump and the mainstream media hyper-focus on interest rates, there is little to no mention of the OTHER fiscal tightening that the Fed has undertaken. To reiterate, the trade war is hitting a nexus, a point of extreme escalation just as the central bankers are about to kill the U.S. economy by tightening into economic weakness. The Meng snafu will be used by the mainstream media to draw the public's attention away from central bank activities and toward the trade war. Everything Trump is doing is HELPING the banks to hide their culpability for the crash. Why do the banking elites want a crash in the U.S.? There are numerous reasons and gains to be had. For an in-depth explanation, I recommend my article 'The Economic End Game Explained.' 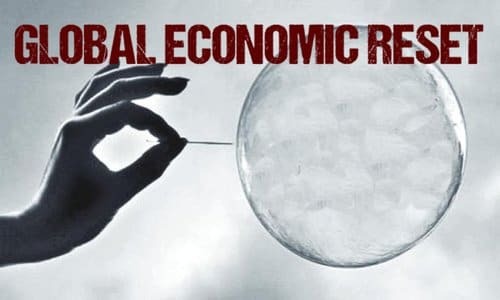 To summarize, globalists are setting the stage for what they often refer to as the "global economic reset." This reset is essentially a major crisis event which will be exploited by globalists to centralize the system even further, into a one world currency and one world economy, governed by the banking elites through institutions like the IMF and the BIS. In the meantime, the globalists hope that the majority of the world will buy into the fallacy of linchpin theory. They hope everyone will blame decentralization and "complexity" instead of centralization and over-simplicity in the system. And it is certainly possible that the hijacking of a Chinese corporate official will be held up as one of the dominoes that started the collapse. Originally published at Alt-Market - reposted with permission.